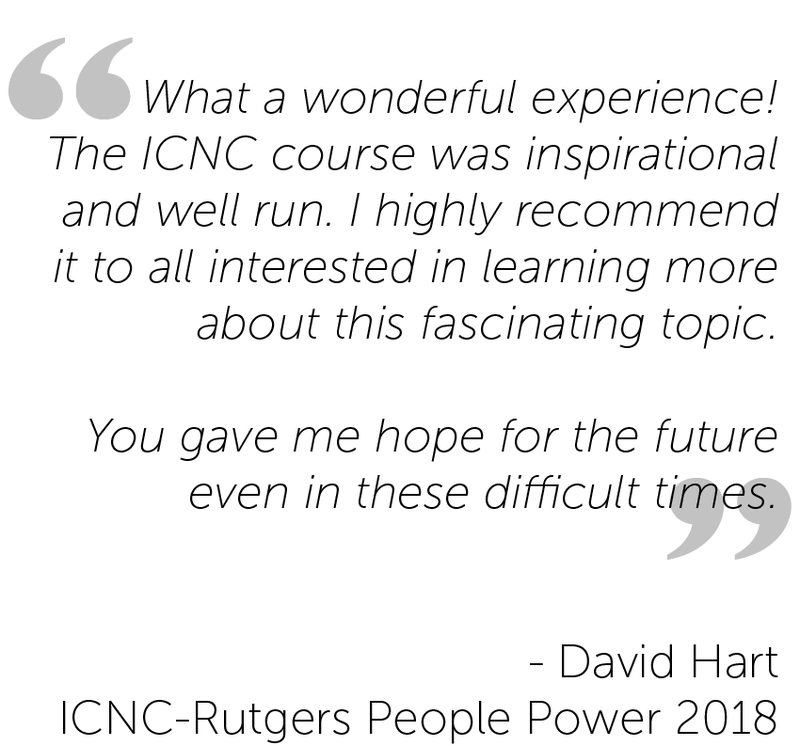 ICNC offered a moderated online course: “People Power – The Study of Strategic Nonviolent Resistance” in partnership with the International Institute for Peace at Rutgers University Graduate School, which took place from September 2nd, 2018 to November 1st, 2018. This was the sixth year that ICNC has run this course. Read more about the 2018 course and assessments below. You can also view assessments from previous courses in 2017, 2016, 2015, 2014, 2013, 2012. In 2018, ICNC received 115 applications for the People Power online course. The quality of applications was high and it took several rounds of reviews to select the 64 participants who were invited to take part in the online course. 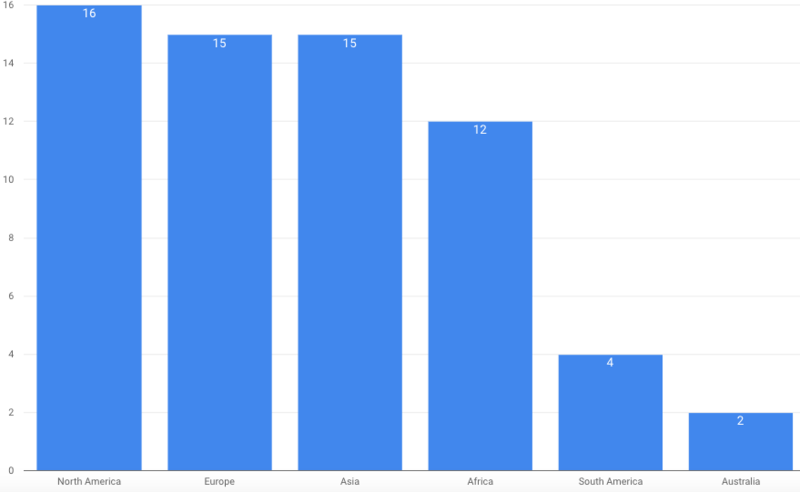 The 64 accepted applicants came from a wide range of backgrounds and countries, as shown in the graphs below. The largest number of participants came from North America with sixteen, followed by Europe and Asia with fifteen participants each. The accepted participants also came from a diverse range of professional backgrounds. 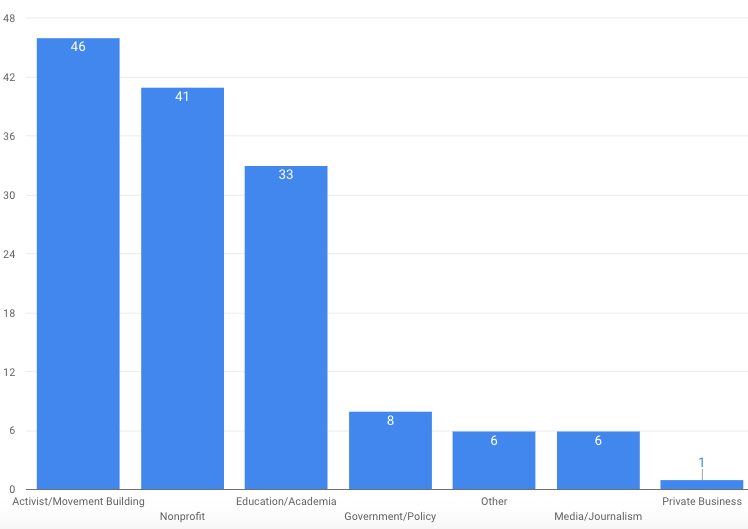 The majority of participants had a background in activist/movement building, followed closely by a background in non-profits, and then by education/academia. Participants could choose more than one answer when selecting their background. Before the course began, ICNC hosted two orientation webinars for course participants. Each orientation webinar contained survey questions asking participants what they hoped to gain from the course. In summary, participants indicated that they wanted to gain practical knowledge on how to organize civil resistance campaigns more effectively, as well as learning about general dynamics, concepts and cases of civil resistance. The participants also wanted to share their own on-the-ground experience with other learners. For the second year, the online course featured interactive group work that participants engaged in. Participants completed this work during Modules 4 and 7. Their work consisted of answering discussion questions, holding video conferences, and developing a summary/statement regarding the content in each respective module. Course participants also had access to the ICNC Mobile App, available on iOS and Android. By using the app, participants could download the course content and access it offline when they were travelling or if they were in areas with low internet access. In the welcome module, we laid out the objectives of the course. We discussed course activities, including forum posts, recorded webinars, readings, videos, webinar meetings and online discussions. We then introduced the participants and course organizers and moderators. We provided online learning tips to help participants make the most of the online learning experience. Finally, we introduced participants to the People Power Game: A Strategic Game About Civil Resistance, a video simulation that participants play throughout the course, during which the player takes on the role of a strategic planner for a nonviolent movement. In this module, participants were organized into nine different small groups and tasked with several group assignments. They watched an ICNC video on the effectiveness of various media strategies and discussed their thoughts and questions with each other in discussion forums. After engaging in an online discussion, participants then held a video conference together. Their work during the module culminated in a group handout with 15 different principles that civil resistance movements can use when creating a media strategy. This module was the second group work module. Participants were given a hypothetical case study and their group assignment was to create an anti-corruption campaign strategy plan. After watching videos and reviewing readings, the groups held online discussions and video conferences to discuss their groups’ campaign plan. They finished the module by creating a campaign strategy plan and sharing their work with the other groups for their review. This module explored a variety of topics in the study of civil resistance, including: women and nonviolent resistance, democratization and civil resistance, and civil resistance and corporate governance. These (and other) topics were considered new frontiers in the quickly evolving field of civil resistance studies. They are often seen as either under-researched or only now gaining significance in the analysis of nonviolent conflict. The Pre-Seminar Learning Gains survey was completed by 37 participants and Post-Seminar Learning Gains survey by 29 participants. The comparative results from Pre and Post-Seminar surveys, included in the graphs below, are based on the responses of 24 participants that filled out both surveys. To see the full results of the Learning Gains surveys, please click here. You can use the links below to navigate directly to each graph. 1) On a scale of 1-5, select the number that best represents your current knowledge of civil resistance or nonviolent movements. 2) On a scale of 1-5, identify your comfort level in speaking to others about civil resistance or nonviolent movements. 3) On a scale of 1-5, identify your comfort level in participating in civil resistance or in a nonviolent movement. 7) On a scale of 1-5, select the number that best represents your view that revolutions against brutal regimes can succeed ONLY if revolutionaries retain the option to use violent means. 12) On a scale of 1-5, select the number that best represents your view about how important you think strategic planing is in a successful civil resistance movement. 14) On a scale of 1-5, select the number that best represents your view about how important you think nonviolent discipline is in a successful civil resistance movement. 16) Please list any and all civil resistance strategies and tactics that you know of. 21) How do you envision applying the knowledge that you gained from this course? 19% of post-seminar respondents selected “5” for the above statement, compared to 0 pre-seminar respondents. 62% of post-seminar respondents selected “4”, compared to 19% of the pre-seminar respondents. 38% of the pre-seminar respondents selected “2”, compared to 0 post-seminar respondents. 2.) On a scale of 1-5, identify your comfort level in speaking to others about civil resistance or nonviolent movements. 28% of post-seminar respondents selected “5” and 62% selected “4” compared to 24% of pre-seminar participants who selected “5” and 4% who selected “4”. 9% of post-seminar respondents selected “3” compared to 48% of pre-seminar respondents. None of the post-seminar respondents selected “1” or “2”. 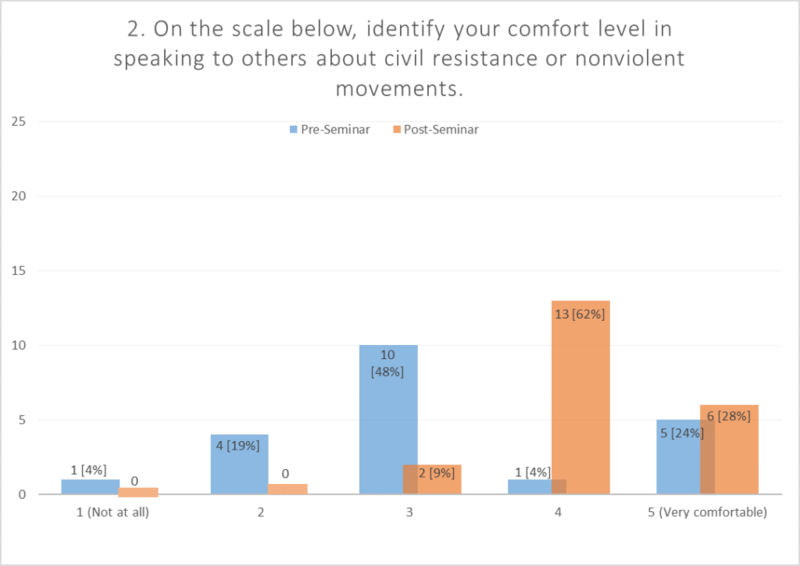 This shows that a majority of respondents felt much more comfortable talking about civil resistance after the course than they did before. 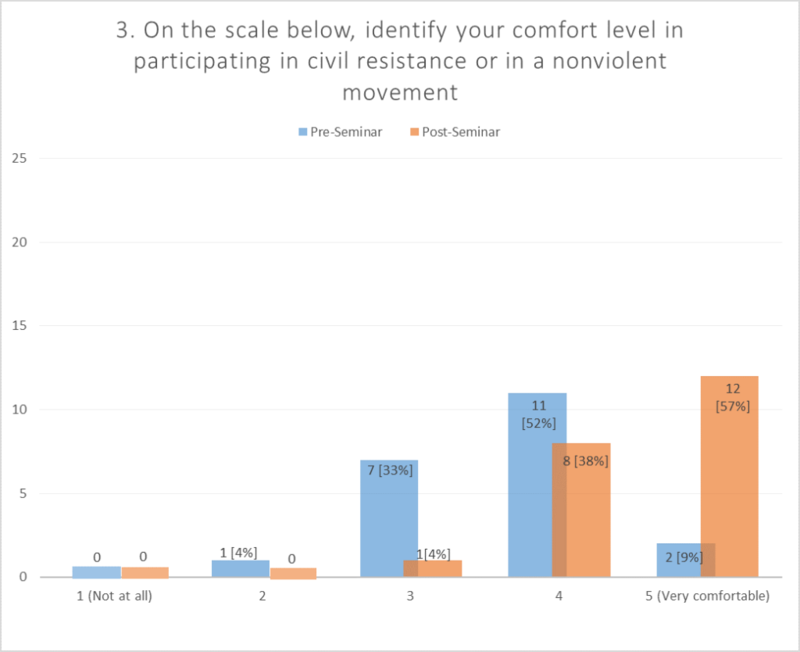 This shows that a majority of participants felt more comfortable participating in civil resistance or nonviolent movements after the course than they did before. 0 post-seminar respondents selected “1”, “2”, “3”. 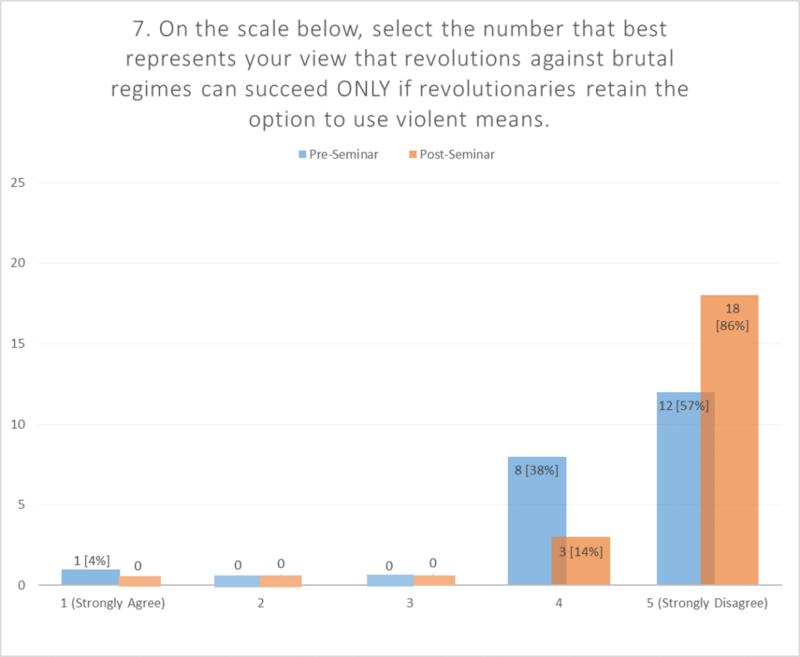 This shows that respondents strongly disagreed that revolutions against brutal regimes could succeed ONLY if they had the option of using violent means. Respondents believed that revolutions could succeed WITHOUT using violence. 95% of post-seminar respondents selected “5”, compared to 62% of pre-seminar respondents. 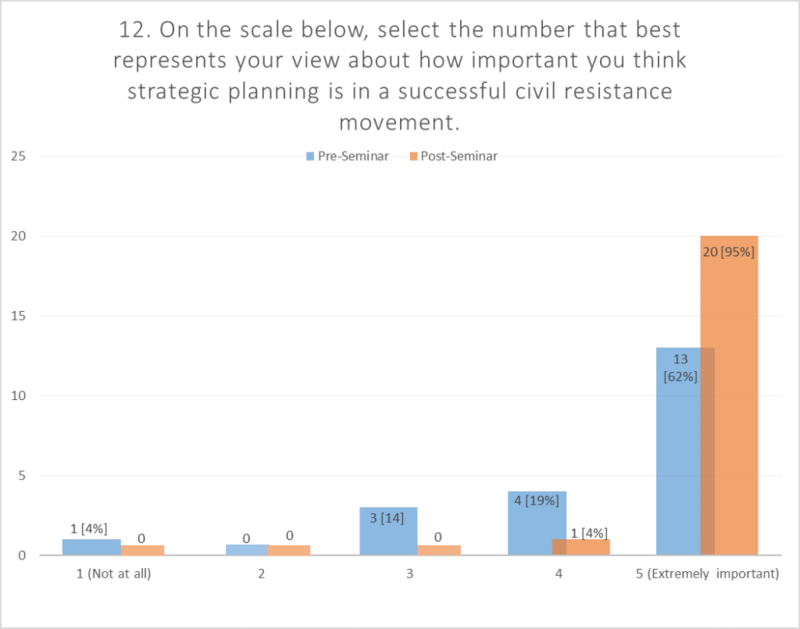 This shows that more respondents believed strongly that strategic planning was essential to successful civil resistance movement after the course than they did before. 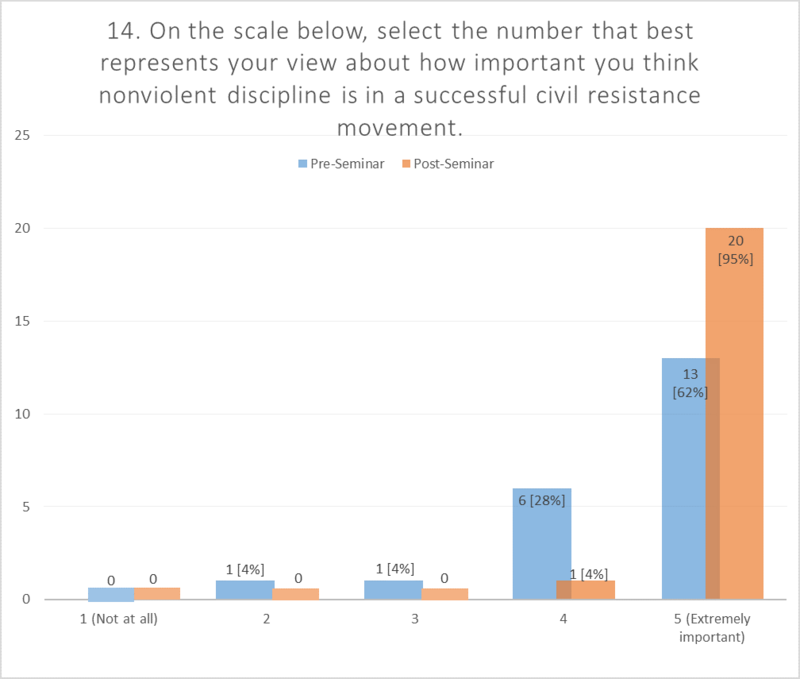 After the course, almost all of the respondents believed that nonviolent discipline was extremely important in a successful civil resistance movement. Post-seminar: The main words that participants chose in the post-seminar survey were: public, symbolic, protest, media, and boycott. 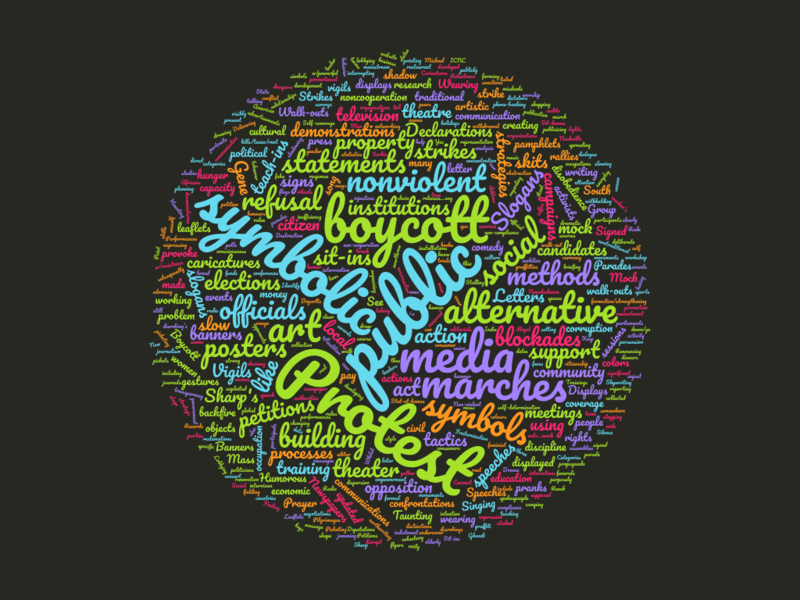 This shows that participants began to appreciate a larger range of nonviolent actions available to activists that, next to protests and demonstrations, consist of noncooperation tactics, including boycotts. They also developed better understanding of the nuances involved with using cultural resistance and the powerful role of media in civil resistance. The word “alternative” was not used at all in the pre-seminar survey, whereas it was used frequently in the post-seminar survey, showing that participants understood alternative institution building as a viable, and sometimes necessary, strategy for nonviolent movements. 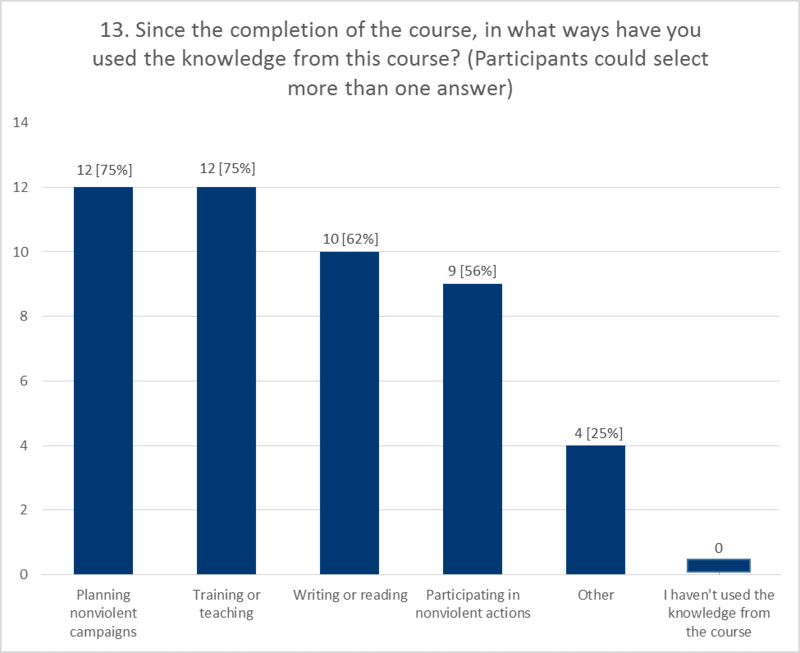 A large majority of respondents, 86%, in the pre and post seminar surveys saw themselves applying their knowledge through teaching, educating or training others. 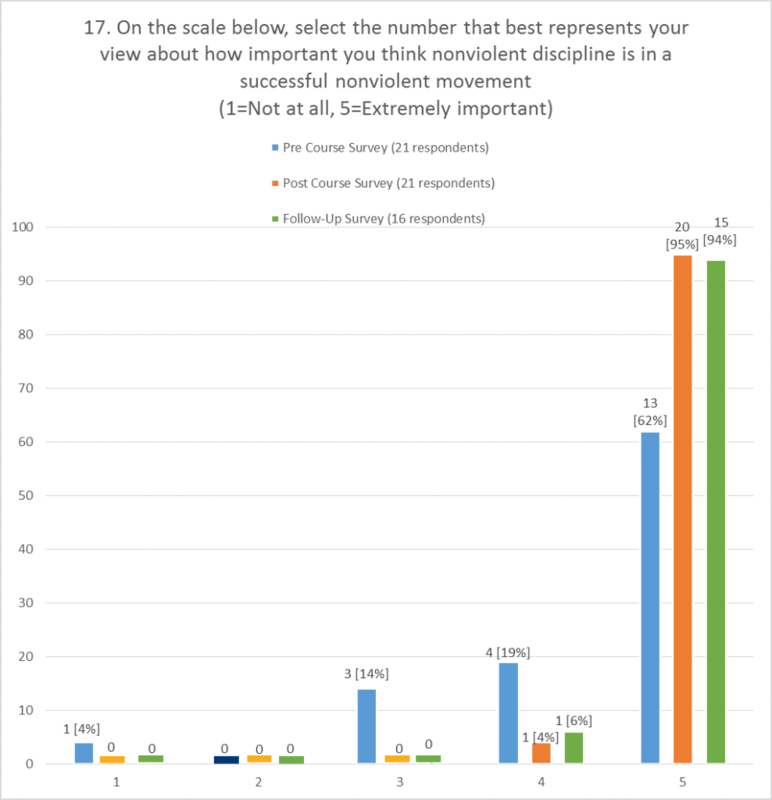 86% of post-survey respondents also saw themselves applying their knowledge directly in nonviolent campaigns. 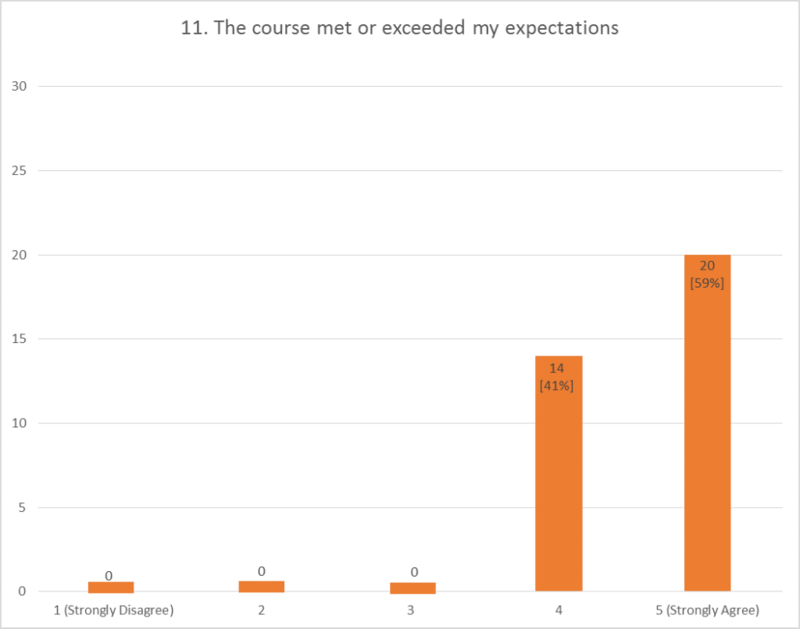 Included below are select graphed responses to questions from the Final Course Evaluation. To see all of the graphs from the final evaluation, please click here. 34 out of 64 participants completed the final course evaluation. 79% of respondents strongly agreed with the above statement and 7 respondents agreed, showing that all of the survey respondents felt that the goals of the course were clear. None of the respondents indicated that they felt the goals were unclear. 3) Taking this online course was a positive experience. 91% of respondents strongly agreed with the above statement and 9% agreed showing that all of respondents felt that being in the ICNC-Rutgers online course was a positive experience for them. None of the respondents indicated that the course was a negative experience. For the second year, the ICNC-Rutgers course featured interactive group work. Although participant feedback shows that there is still room for improvement, the responses were generally more positive than last year. 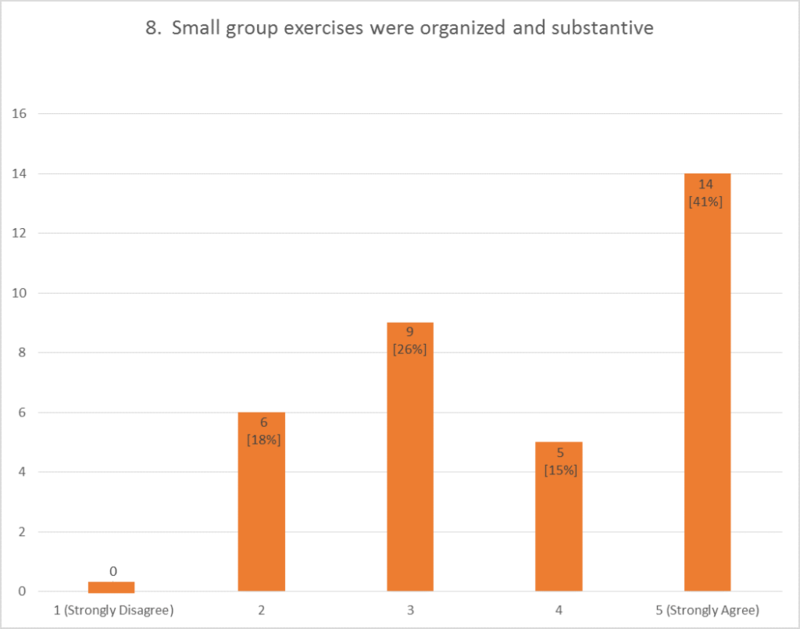 41% respondents strongly agreed with the above statement and 15% agreed, showing that the majority felt that the group exercises were organized and substantive. 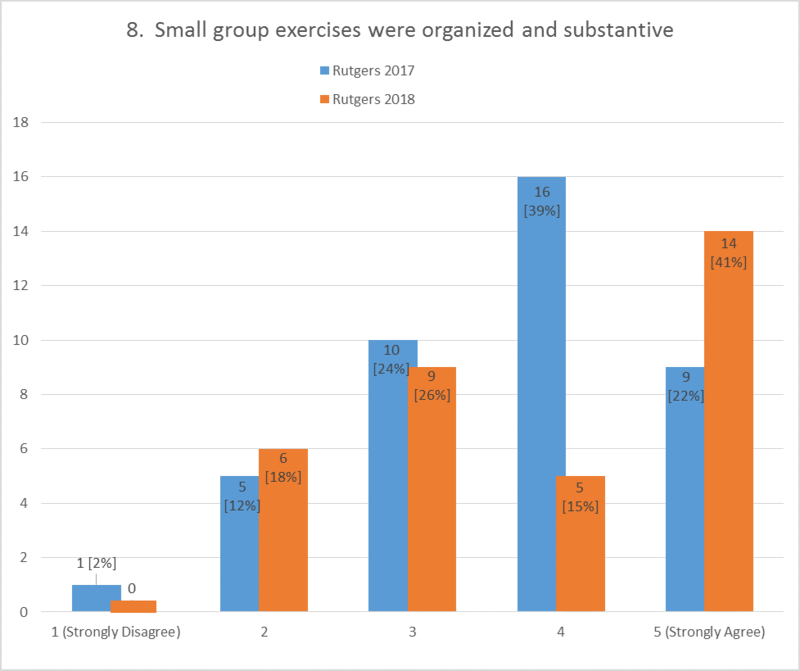 26% selected “3”, showing that there is still room for the course small group exercises to be improved. However as the second graph below shows, in the 2017 ICNC-Rutgers course only 22% strongly agreed with the above statement, showing that there was an almost 20% increase of respondents who strongly agreed with the above statement. This increase can be attributed to several changes that ICNC made in the 2018 course. Participants were given more time to introduce themselves to each other and were encouraged to create FB, slack, WhatsApp or other social media groups. The group work instructions were also clarified so that participants could distinguish between work that they were to do as individuals and work that was to be done with the whole group. Lastly, ICNC created volunteer roles within each group, in order to ensure that there was an appropriate division of labor within the group members. 59% of respondents strongly agreed with the above statement and 41% agreed, showing that all respondents felt that the course met or exceeded their expectations. None of the respondents indicated that the course didn’t meet their expectations. 88% of respondents strongly agreed with the above statement and 12% agreed, showing that all respondents felt that they would recommend the course to other people. None of the respondents indicated that they wouldn’t recommend the course. 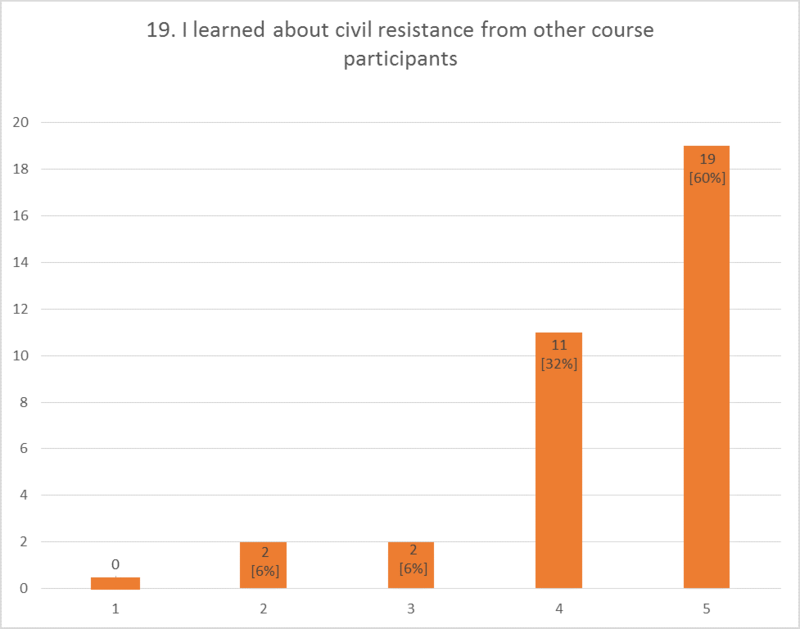 79% of respondents strongly agreed with the above statement and 21% agreed, showing that all of the survey respondents felt that they had more knowledge about civil resistance and its various topics than before taking the course. None of the respondents indicated that they had less knowledge or the same amount of knowledge. 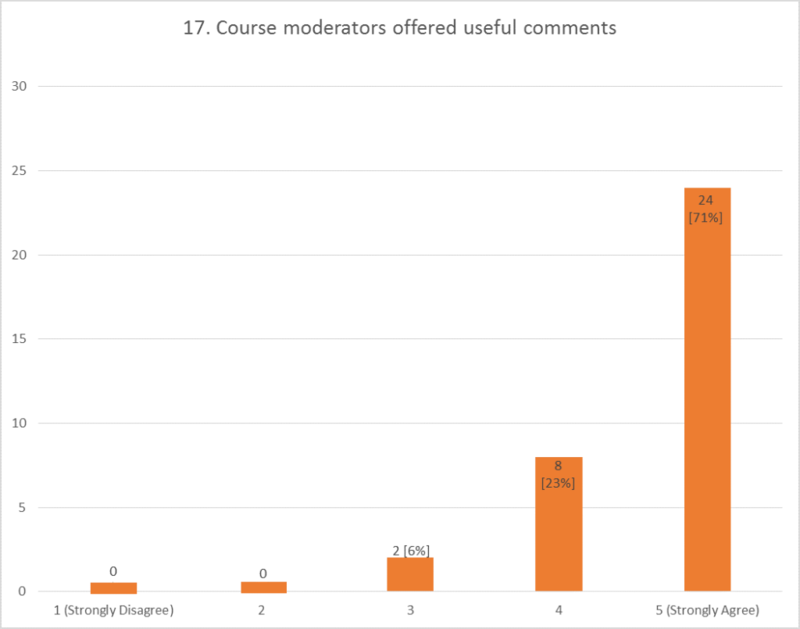 71% of participants strongly agreed with the above statement and 23% agreed, showing that almost all of the respondents found the course moderation to be useful. Only 6% selected “3” and none of them selected “1” or “2”. 60% of respondents strongly agreed with the above statement and 32% agreed, showing that most respondents felt like they learned from each other during the course. 6% of respondents selected “3”, 6% selected “2” and none of them selected “1”. 82% of respondents strongly agreed with the above statement and 15% agreed, showing that almost all of the respondents felt that the knowledge gained in the ICNC-Rutgers course would relevant to them professionally. Three months after the ICNC-Rutgers 2018 course ended, the participants in the course were asked to complete a follow-up survey. 16 participants responded. Included below are the graphed responses to selected questions from the follow-up survey. To see the full results of the follow-up survey, please click here. You can use the links below to navigate directly to each selected graph. 1. If you joined a civil resistance campaign in the past three months, how influential was the online course in your decision to do so? 2. Compared to before the online course, how actively involved are you currently in writing, researching, or teaching about civil resistance? 3. 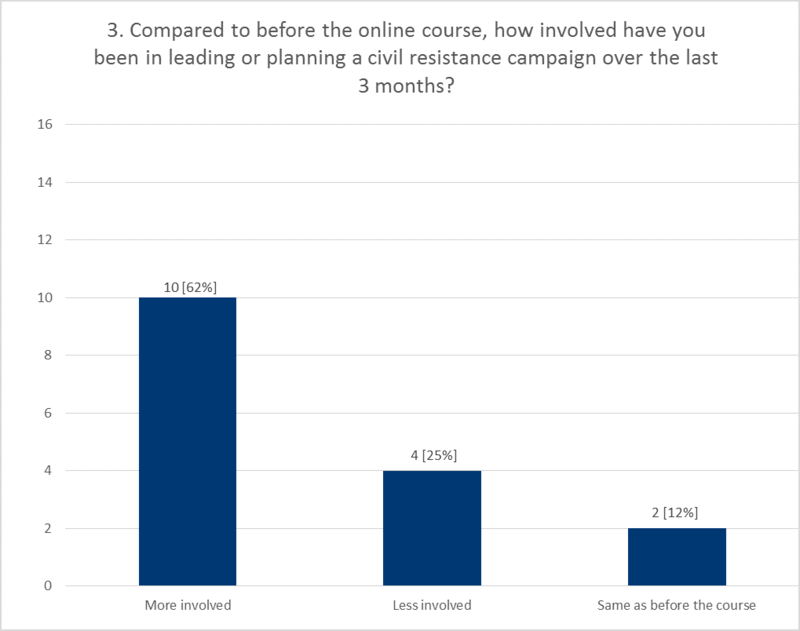 Compared to before the online course, how involved have you been in leading or planning a civil resistance campaign over the last 3 months? 5. 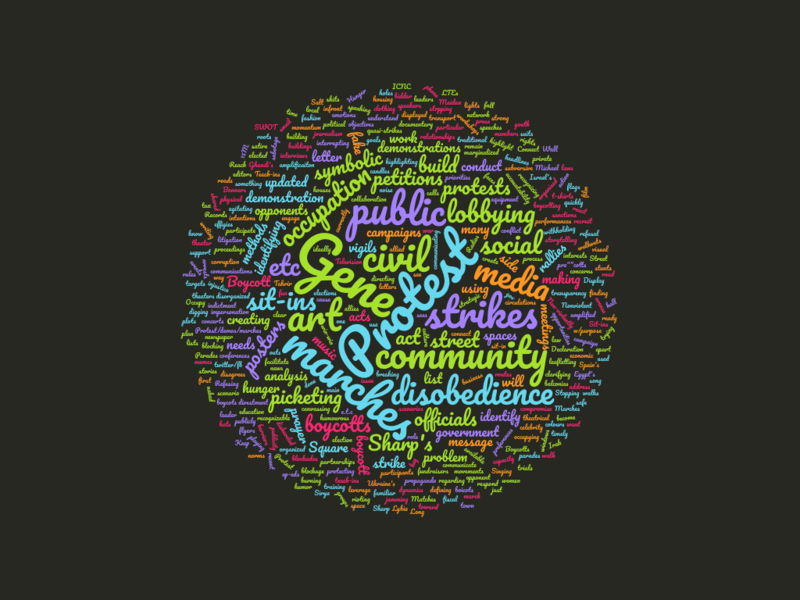 Over the last 3 months, do you think that your skills in planning a civil resistance campaign have improved in comparison to your skills prior to taking the online course? 9. Over the past three months, how regularly did your campaign/movement consult educational materials on civil resistance? 11. Please provide us with a brief description of a civil resistance action within the last three months that your campaign/movement considered to be successful. In what ways, if any, did the knowledge gained from the online course impact the action’s success? 12. Please provide us with a brief description of an educational training/workshop within the last three months that your campaign/movement considered to be successful. In what ways, if any, did the knowledge gained from the online course impact the training/workshop’s success? 14. Since the completion of the course, how interested are you in learning more about civil resistance? 15b. 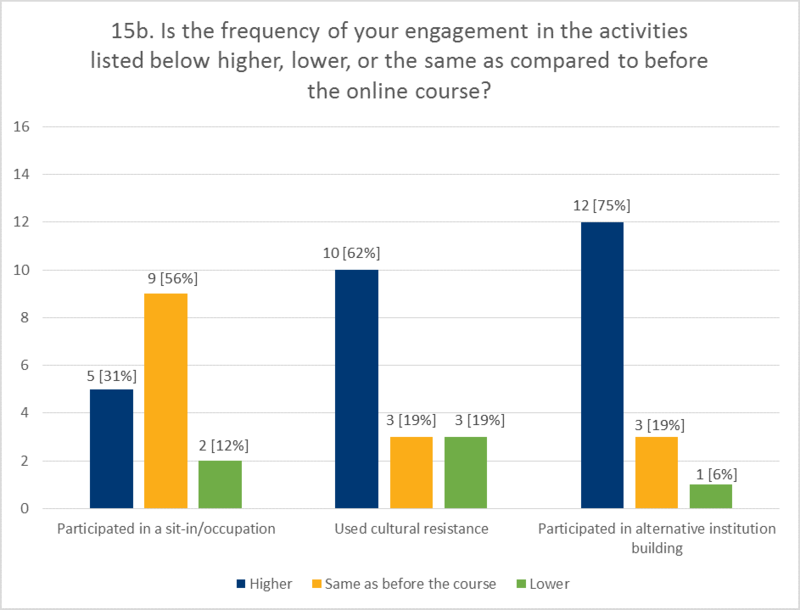 Is the frequency of your engagement in the activities listed below higher, lower, or the same as compared to before the online course? 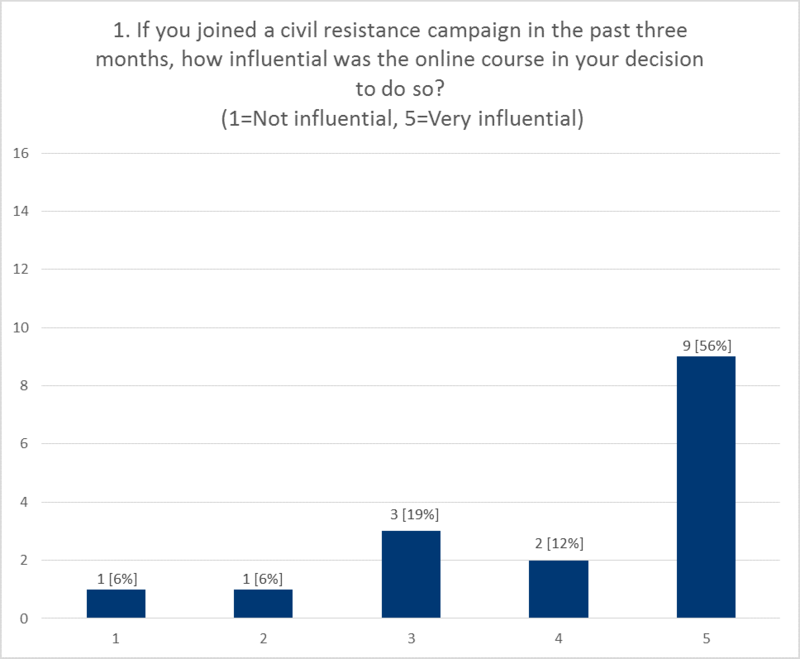 56% of respondents stated that the online course was very influential in their decision to join a civil resistance campaign after course. 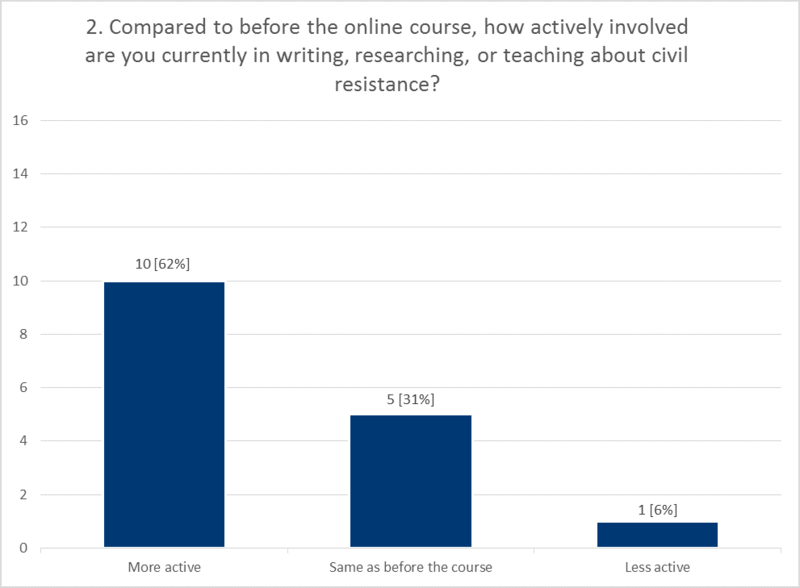 62% of respondents are more actively involved in writing, researching, or teaching about civil resistance than they were before the course. 62% of respondents are more actively involved in leading or planning a civil resistance campaign than they were before the course. 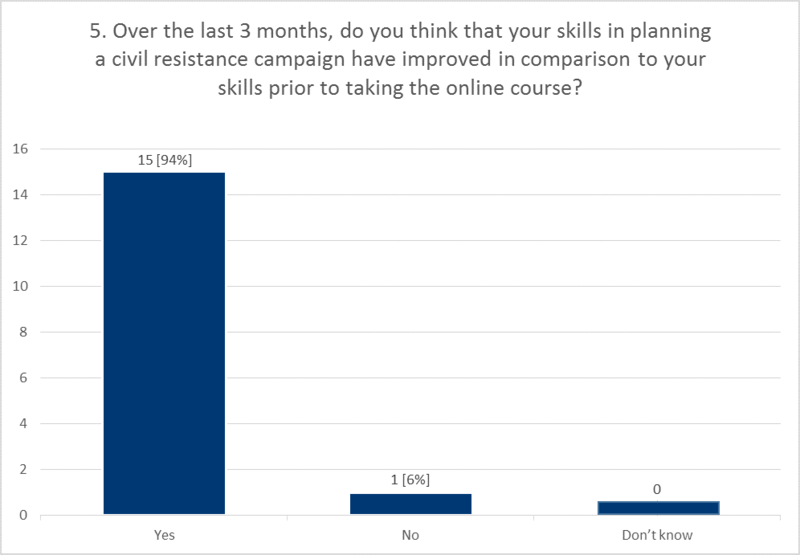 94% of respondents think that their civil resistance campaign planning skills have improved since taking the online course. 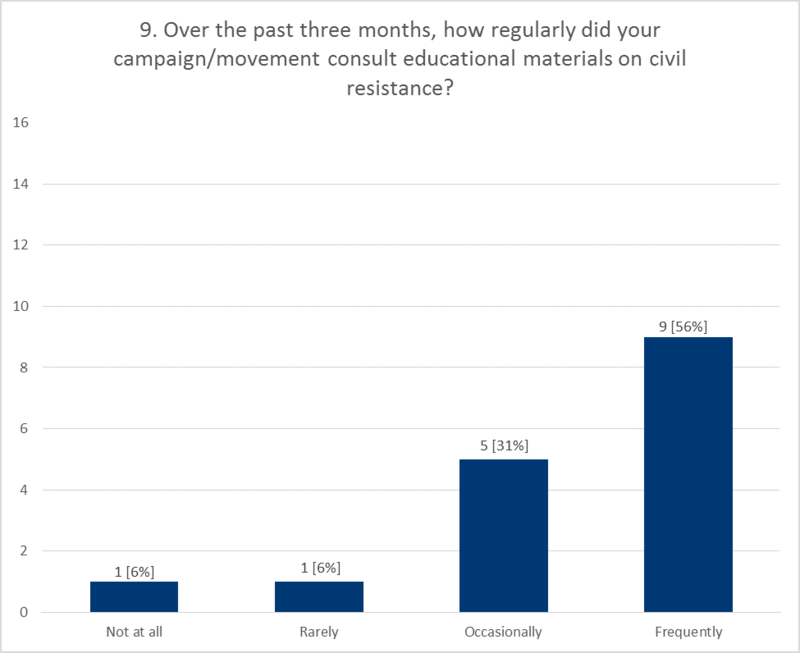 56% of respondents reported that their campaign/movement frequently consulted educational materials on civil resistance. 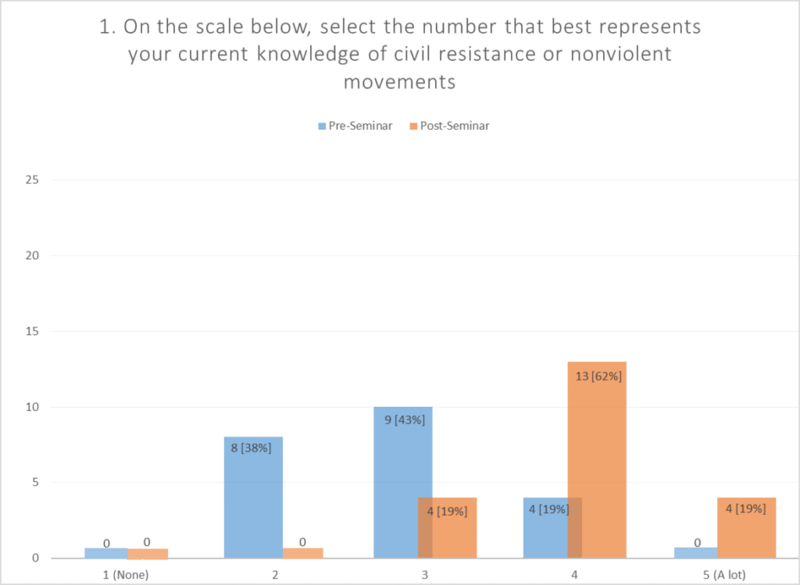 75% of respondents have used their knowledge from the course in planning nonviolent campaigns and training or teaching about civil resistance. 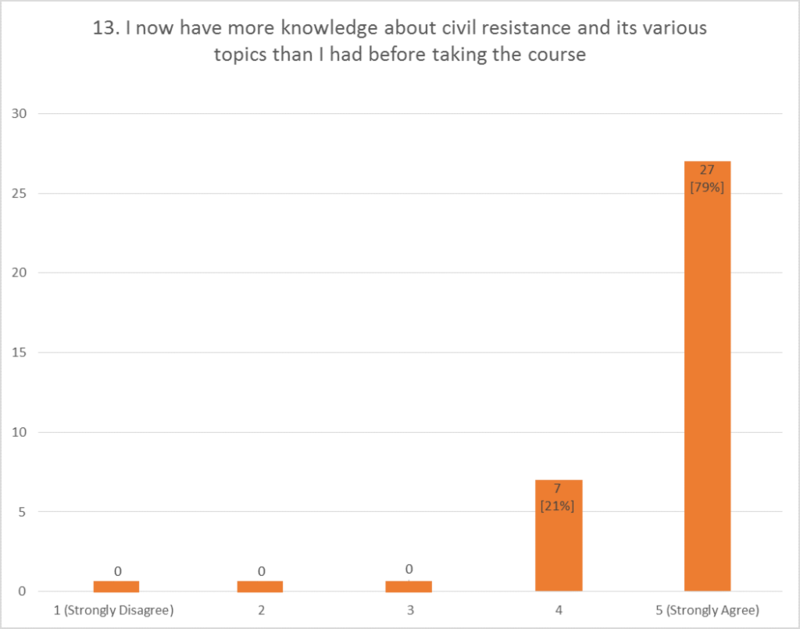 62% of respondents used their knowledge in the course in writing or reading about civil resistance. Participants who selected “other” indicated that they used their knowledge to create local trainings. Their knowledge from their course was also useful for the design and implementation of projects that they started working on after the course. 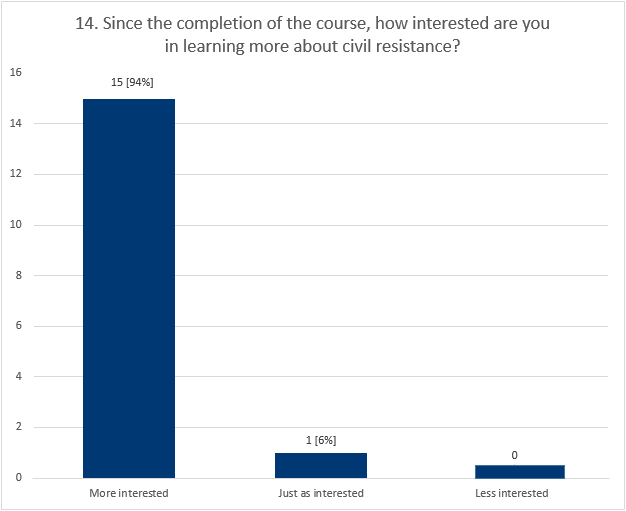 94% of respondents are now more interested in civil resistance after taking the online course. 75% of respondents are more frequently engaged in alternative institution building than they were before the course. 62% of respondents are more frequently engaged in cultural resistance (music, art, humor, etc.) than they were before the course. In the pre course survey, 62% of respondents believed that nonviolent discipline was extremely important in a successful nonviolent movement. In the post course survey, that number had increased to 95% of respondents believing that nonviolent discipline was extremely important. That percentage was nearly the exact same in the follow-up survey, as 94% of respondents selected that nonviolent discipline was extremely important.